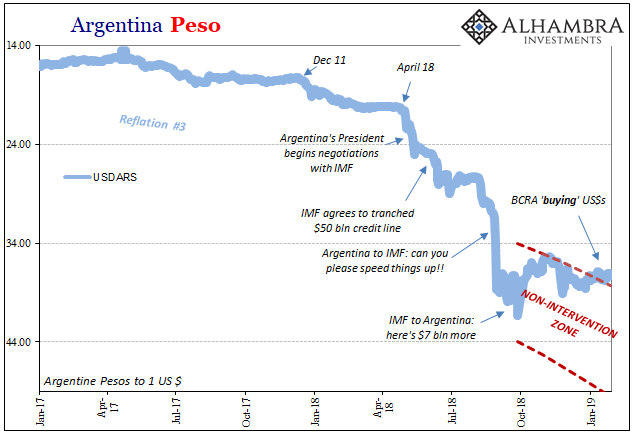 As Argentina’s peso careened toward oblivion, the country’s government begged IMF officials for more money. The organization in June 2018 had already agreed to a bailout expected to total more than $50 billion over three years, the largest in the fund’s history. But it wasn’t working, and as the currency crisis accelerated toward the end of August there was little else that could be done. In September, IMF officials visited Buenos Aires and agreed to provide about $7 billion more. The new funds came with drastic conditions attached. Argentina’s central bank, Banco Central de la Republica Argentina (BCRA), would have to abandon its previous monetary policy regime (no loss there). The country had to get hold of its money supply first, the prior inflation target no longer any priority. As for the peso, this is really where the IMF got creative. Seeking to take advantage of market expectations, and thereby craftily creating a new set of them, BRCA would sign an agreement giving up all foreign exchange interventions inside a preset “non-intervention zone”. The NIZ was initially set at 34 on the high side and 44 to the low, but it will keep moving lower at a rate (marked daily) of 3% per month. The global market expects the peso to fall, so will the BCRA. This will be a controlled decline rather than a crash. If the peso was to deteriorate precipitously as it had since April, even outside the non-intervention zone BCRA would be restricted to $150 million of peso purchases per day. Such constraint limits the amount of reserves Argentina might burn through at the same time keeping the internal money supply predictable. At the upper limit, should the peso trend even sideways, with a depreciating band this would set up BCRA to actually purchase “dollars” and build up forex reserves all the while the peso continued to decline. A very neat little trick. This intervention would be limited to $50 million per day. You have to hand it to the IMF folks for their creativity in turning market expectations to their advantage – at least in the short run. That’s just what happened, starting in January 2019. The peso hasn’t really improved but it is no longer crashing. With the zone on the move lower, the peso is now outside the NIZ but on the high side! This has meant the BCRA buying up “dollars” throughout this month.